I know that, just yesterday, the Yankees allowed 14 runs. They allowed eight runs the game before that. They allowed seven runs two games before that. By park-adjusted ERA, the Yankees presently rank 20th in baseball, which is not very good. This is hardly the time to celebrate the pitching staff. On the other hand, by park-adjusted FIP, the Yankees presently rank fifth in baseball. By park-adjusted xFIP, the Yankees presently rank second in baseball. By strikeout rate, they’re first. The Yankees have been great! They just haven’t gotten the results. Perhaps this *is* a good time to celebrate the pitching staff. Yet this isn’t really a celebration at all. Rather, it’s an observation. It might be an observation of a good thing, or it might be an observation of a bad thing. Could even be an observation of an ultimately insignificant thing. But, the Yankees’ pitching staff? Collectively, they’re out there on an island. There’s no other pitching staff like it. Half-decent pitch-type data exists going back to 2002. Let’s start there. 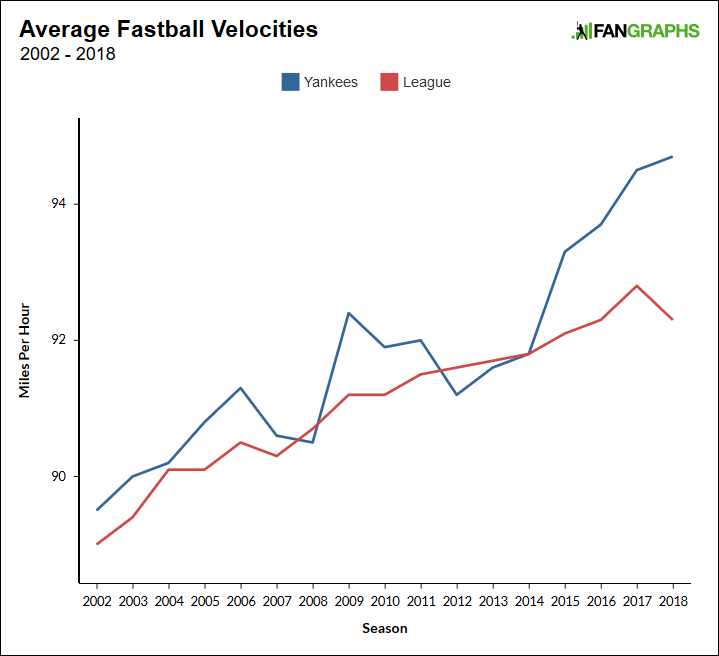 In the following plot, you see the Yankees’ average fastball velocities, and the league-average fastball velocities. It’s not true in every individual case, of course, but there’s a pretty good relationship between fastball speed and fastball effectiveness. The quicker a fastball gets up there, the less time a hitter has to react. Also, the more difficult it is for a hitter to adjust to something slower. For a while, the Yankees kind of tracked the league average. They were more above than below. And then, in 2015, the Yankees pulled away. They threw 1.2 ticks harder than average. Then 1.4, then 1.7. Right now, the difference is 2.4. Even though it’s obviously early, the Yankees have the fastest average fastball in the game. They’re up slightly, even from last season. The Yankees are powerful, on both sides of the action. Now to flip things around. That plot showed fastball speed vs. average. This plot shows fastball rate vs. average. The Yankees were right there around the league-average line, until beginning to separate in 2012. First, the gap was two percentage points. Then it doubled, and then it doubled again. In 2016, the gap was nine percentage points. In 2017, it was 11 percentage points. And now? Now, there’s a gap of almost 17 percentage points. The Yankees, as a staff, have thrown baseball’s hardest fastball. And the Yankees, as a staff, have thrown baseball’s lowest rate of fastballs, and by a considerable margin. The concept here isn’t new. The Yankees had the second-lowest fastball rate in 2015. They had the lowest fastball rate in 2016, and then again in 2017. Tom Verducci gave them the feature treatment last July. The word has clearly gotten out that the Yankees are trying to upend long-standing pitching tradition. What’s striking to me is that, as extreme as the Yankees already were last time around, they’ve only become more of an outlier. In 2016, the Yankees had the lowest fastball rate by 1.5 percentage points. In 2017, the separation was 3.4 percentage points. In 2018, the current separation is 8.3 percentage points. That’s about the same as the gap between the second-lowest fastball rate and the 14th-highest. The Yankees already had a plan. Now they’re leaning into it. I’ll note that, between seasons, the Yankees haven’t actually started throwing fewer four-seamers. Instead, they’ve trimmed what was already a league-low rate of sinkers. It’s not like all sinkers are doomed to fail in this era of home runs and elevation, but the Yankees have decided to steer away from them almost entirely. Even if it doesn’t ultimately work, it’s still a pattern that’s hard to miss. I have one more plot to show you. One potential problem with analyzing team numbers between seasons is that you don’t account for personnel changes. So what I’ve done is calculate “expected” team fastball rates for 2018, based on pitches thrown, and on individual fastball rates from last season. I’ve then subtracted that expected rate from each team’s actual rate in the early going. The Yankees, again, are highlighted in yellow. Based on the Yankees’ pitcher usage, we would’ve expected a fastball rate of around 48%, using 2017 fastball rates. Instead, we see the Yankees around 40%, yielding a difference of 8.1 percentage points. This is further proof that the Yankees have dropped ever lower. 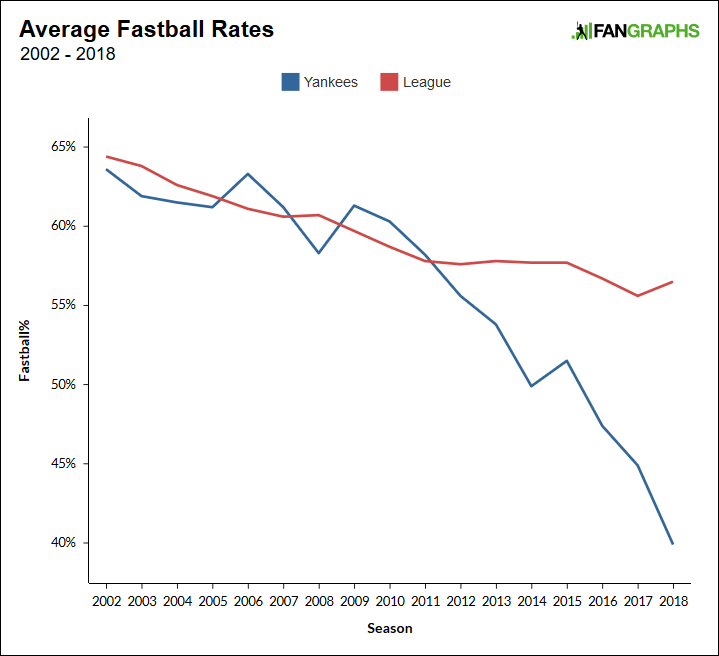 The Yankees have baseball’s second-lowest expected fastball rate, with the Rays at the very bottom, but the Rays have gone in one direction while the Yankees have gone the complete opposite way. The Yankees, plain and simple, are even more fastball-averse than they were. The Yankees have 14 pitchers who have thrown at least 50 pitches, and who pitched in the majors last year. Only Jonathan Holder has increased his fastball rate by double-digit percentage points. Only three pitchers have increased their fastball rates by any amount. The remaining 11 pitchers have all decreased their fastball rates, and all by at least five percentage points. Six pitchers have decreased their fastball rates by double-digit percentage points. Two pitchers have decreased their fastball rates by more than 20 percentage points — Tommy Kahnle and Sonny Gray. They have, in the early going, the biggest drops in fastball rate in the game. In sum: The Yankees were already receiving plenty of attention for steering away from their fastballs. Now, they look even more extreme, which isn’t the way extreme data points are supposed to work. Given that no team throws a harder average fastball than the Yankees do, you’d think they’d love those pitches. And this isn’t even proof that they don’t. I’m sure the Yankees recognize they have a bunch of good fastballs. But that doesn’t mean you need to throw them 60% of the time, or even 50% of the time. Ultimately, batters are almost always looking for fastballs. Teams and pitchers know that, but no other team has yet been so willing to rely on the secondary stuff. The Yankees have effectively made secondary stuff out of their primary stuff. It might not give them the best pitching staff around, but it should at least make them frustrating to oppose. In baseball, there’s more than one way to succeed. The Astros throw an above-average rate of sinkers. 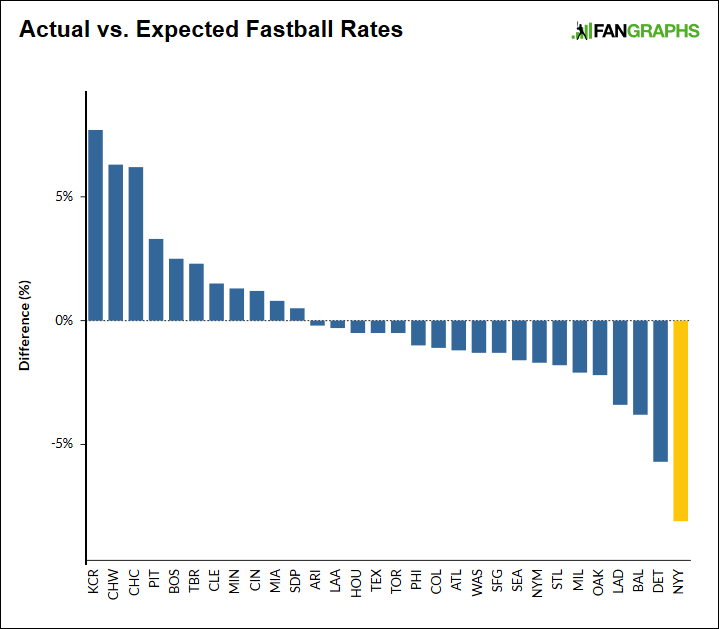 The Cubs throw a way above-average rate of fastballs. The Yankees aren’t the first team to discover that batters strike out, and they’ll strike out in a variety of different ways. It’s just, it’s not often you can so easily spot an individual team strategy. Teams are generally looking more and more alike. With the way that they pitch, though, the Yankees are exceptional. They’re off on their own, trying to figure out how few fastballs is too few fastballs. I can’t say I’m not curious. We hoped you liked reading The Yankees Have a Pitching Style All Their Own by Jeff Sullivan! Fascinating post, particularly after reading your Tanaka article earlier today. 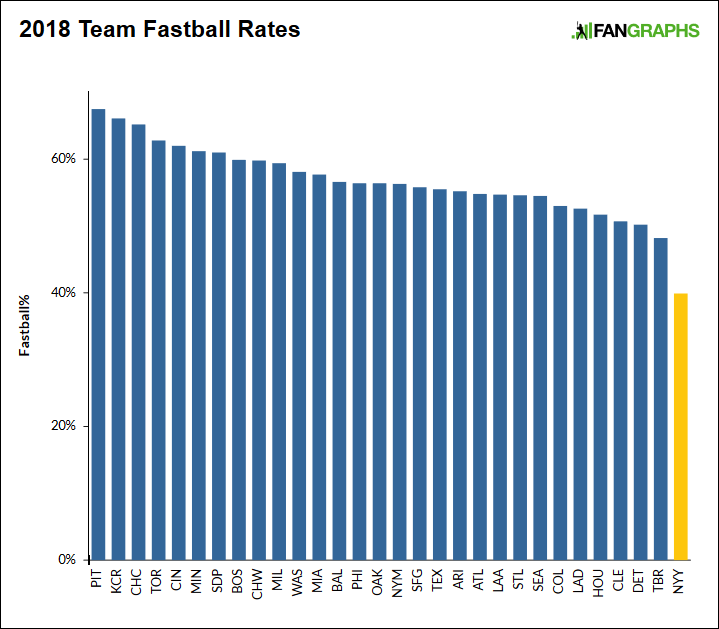 All I can say is that, if you had asked me prior to reading this, I would never have guessed that the fastball rate was even close to that low. I really like it, in theory. The Gerritt Cole example obviously sticks out as a place where you can make high velocity pitchers much more effective.